I have to confess that I absolutely LOVE our Thanksgiving and Christmas dinners. I love cooking them, I love serving them to my family, and I especially love the leftovers. Creating a new meal from the leftovers is just so much fun! Everything has already been cooked at some point, so all you’re really doing is re-assembling the foods in a new and different way… how hard can that be? 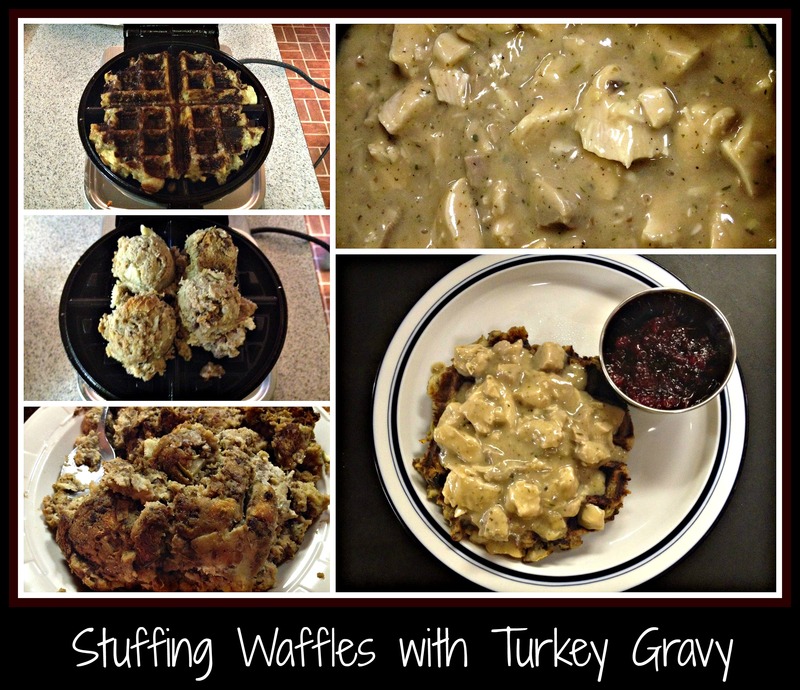 Last year, I used the stuffing to create “stuffing waffles”… if you haven’t tried this before, you HAVE to try it. They were simply incredible! 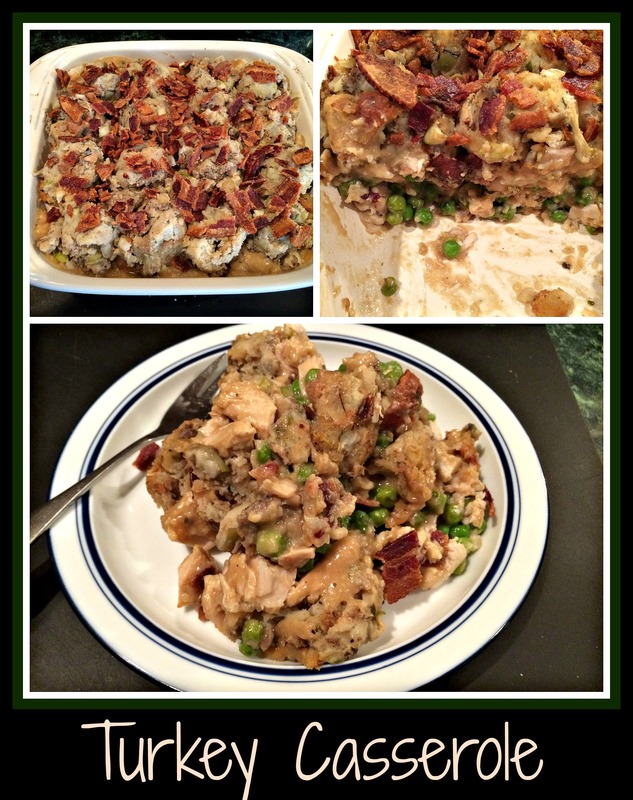 You can check out my recipe here, which also talks about topping them with turkey gravy. Serious “yum” factor here. This year, I decided not to get the waffle iron down, so I came up with this new casserole. Same sort of “yum” to the flavor… just a whole new twist. I layered about 2 cups of our Mimi’s Peas Casserole (it’s the same “green bean casserole” that everyone else does… we just use frozen peas instead. GENIUS! ), sprinkled 1 cup of diced turkey on top, then spooned 3/4 cup of leftover gravy just to cover the turkey. To finish this off, I took scoops of leftover stuffing and put stuffing balls over the entire casserole, then smooshed them down with my fingers to “connect” them as a topping. Just for extra flavor, I crumbled about 3 slices of bacon over top, but these really weren’t necessary… this casserole was stellar all by itself. 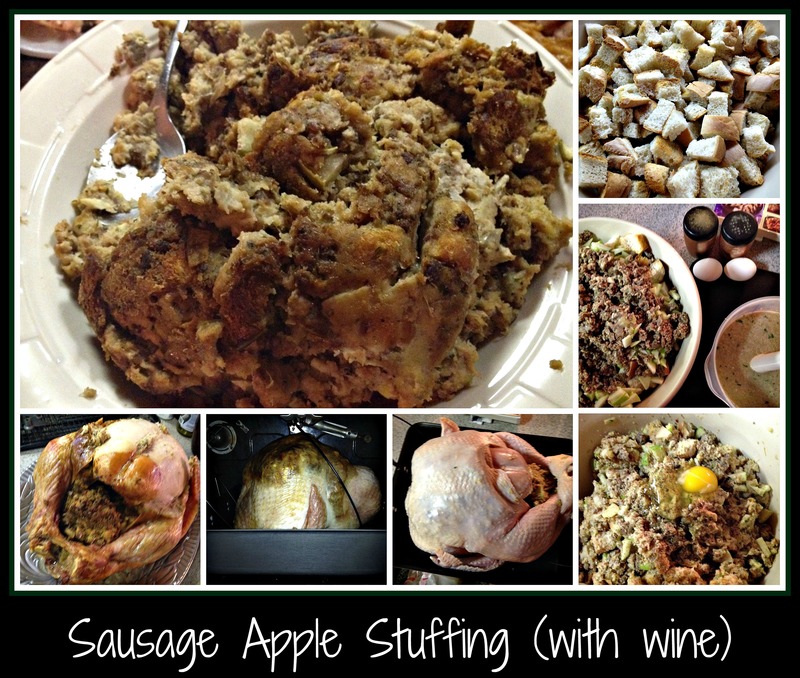 NOTE: Before you ask where the “wine” is in this recipe, remember that I used wine when I made the stuffing AND the gravy (and it’s in the peas as well), so I didn’t really feel the need to add more, but you’re welcome to add a little to the gravy if you think it’s too thick. Just use your best judgement. Once everything was assembled, I baked the casserole for dinner at 375 degrees for 35-40 minutes or until the gravy was visibly bubbling. This dish was honestly so good that we ate it for two nights in a row… all the flavors of a holiday dinner wrapped up in one meal. YUM! One of the best things about this recipe is that it uses up the leftover Crab Dip that I had from our family’s Thanksgiving dinner this past weekend. Crab Dip is a thing of beauty…. thick, creamy, and so very decadent. The hard part comes when the entire recipe isn’t eaten and you have to find something that is equally delicious in which to use all that fabulous crab… and this, in my opinion, is it! 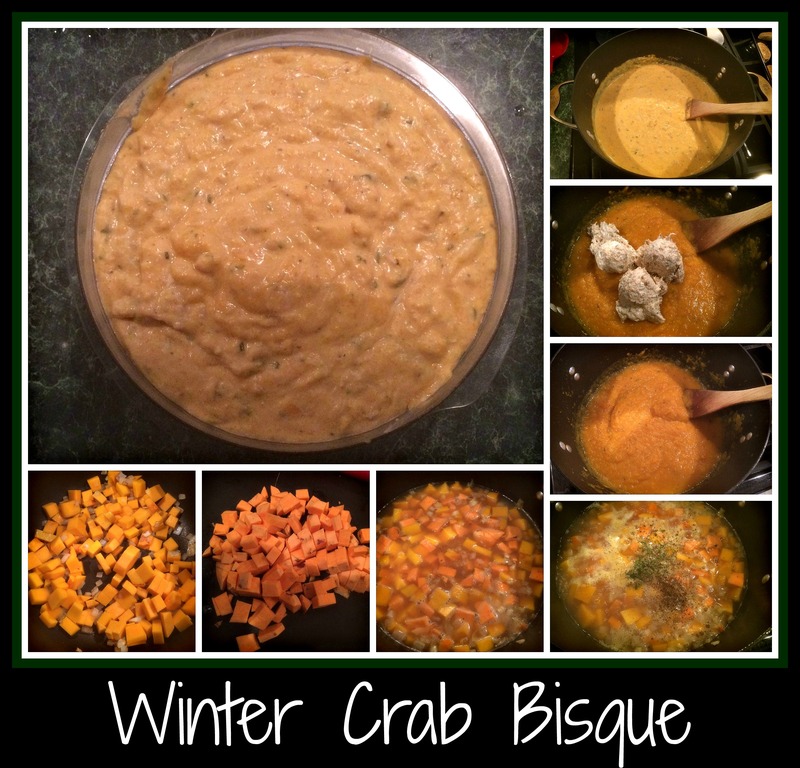 I started my Winter Crab Bisque by making the soup base. I diced half an onion and sauteed it in a bit of olive oil. I then diced 3/4 of a butternut squash (about 4 cups) and one large sweet potato and added them to the large stock pot, turning the heat to medium to start a simmer. Quickly adding equal parts chicken stock and white wine, I gave the vegetables time to cook on a low boil until everything was soft. I had chosen to use marjoram, some fresh rosemary, and pepper for my seasoning, so added these to the cooking vegetables so the flavors would combine. Once the vegetables were soft (almost “falling apart” soft), I used a stick blender to thoroughly mash everything until smooth. The soup was still very warm at this point, so I turned off the heat and added the cold leftover crab dip. NOTE: My Crab Dip recipe couldn’t be easier… it comes from my cousin, Kris, and it’s as easy as warming 1 stick of butter and 1 block of cream cheese in a double boiler, then adding 1 lb crabmeat and seasoning with Old Bay and parsley. After adding the cold crab dip, I simply folded the soup over the dip until everything came to the same temperature and combined nicely. The crab dip had already been seasoned with Old Bay and parsley, so this was a lovely addition to the winter vegetables in the soup, coming together to make a thick and hearty bisque that could warm the coldest hearts on a winters day. One extra note on the crab dip: my official recipe from Kris says to use Lump crab meat, but the cost was about to make me choke, so I substituted claw meat, which was half the cost of the lump crab meat. I was pleased with the results, but I was also serving a bunch of guys who don’t mind the difference. If you’re trying to impress, the lump crab meat is definitely more “perfect”, but I tend to lean more toward something that’s less costly if I’m mixing it into other ingredients. I do hope you’ll try this simple, yet elegant dish. I made it in under an hour this morning and am very happy with the results. If you’re looking for a delicious bisque recipe that isn’t going to send you running to the store for new/unique ingredients, this is a great option! Enjoy! If you’d been given the task of bringing the Cranberry Sauce to the family Thanksgiving table, this is definitely a recipe to try. The flavors of the red wine and cranberry, combined with a citrus-y touch of orange make this cranberry sauce recipe a simple and delicious addition to any style of holiday spread. The recipe is incredibly simple. Into a medium sauce pan, mix 1 cup of dark red wine (I used a deep, dark Zinfandel but you’re welcome to use whatever wine you like. ), 1 cup of sugar, and most of a bag of fresh cranberries (saving 1/2 cup of berries to add at the end of the cooking process), the zest and juice of one navel orange, and 1/4 teaspoon salt. Cook this mixture on medium until it starts to boil, then reduce and cook at a low simmer until the sauce becomes thick and all the berries have popped. While the sauce is cooking, chop the saved 1/2 cup of berries to a fine dice. Once the sauce is thoroughly cooked, stir in the diced berry pieces and remove from heat. Move the completed sauce into a resealable container and store in the fridge until you need it. 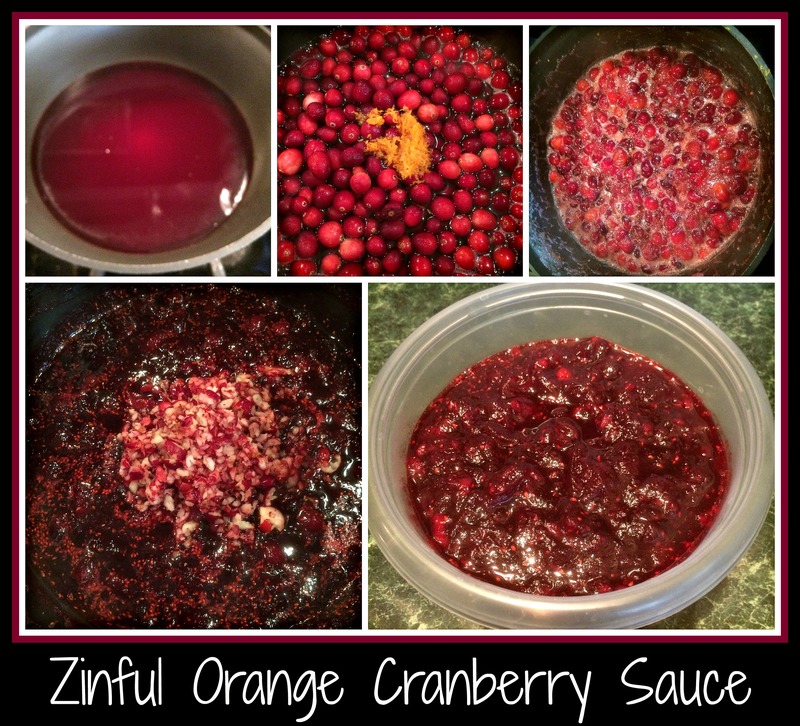 If you only have a white wine on hand, feel free to use that in place of the Zinfandel in this recipe, or check out the other cranberry sauce recipes on this blog. While I don’t remember ever enjoying cranberry sauce when I was younger, it has become one of my favorite sides for holiday meals. I’m always looking for a new and unique way to use leftovers, especially from holiday meals. We seem to have extras of everything in the fridge, so I find it very exciting when a new idea comes around. This recipe idea was one that my husband found and it really looked fun. A new way to use my waffle maker other than just making waffles? I’m IN! I started by making the turkey gravy that would go on top of our dinner. Basically, I reheated the leftover gravy from Thanksgiving and, using James River Cellars Reserve Chardonnay, flour, and chicken stock, I thinned the gravy out to make more and then added chunks of leftover turkey. Once this was done, I turned my attention to making the waffles. I preheated my waffle iron and then sprayed it with cooking spray before starting. Using a large cookie/muffin scoop, I put one scoop of cooked stuffing into the center of each quarter of the waffle iron and let it all cook for 7-10 minutes. Seriously, it was that simple. I didn’t add anything to the stuffing… it was already moist enough that it toasted up nicely in a short amount of time. When the waffle was crispy, I turned it onto a plate, topped it with turkey gravy and added a side of homemade cranberry sauce. It was a really delicious way to enjoy our favorite parts of Thanksgiving in a new and tasty way. I hope you’ll try this way of making your leftovers into something different instead of just reheating the same meal for a few days in a row. As yummy as that is, having a new and unique meal that incorporates your leftovers can be really fun. Honest!